Finding simple tools to keep your kitchen countertops clutter-free can be easier said than done. These kitchen counter solutions will get you on your way to a clutter free kitchen. It’s no surprise that cluttered counters are a frustration for most homeowners. There is just something about an open space that calls to us clutter bugs and kitchen counters seem to be perfect dropping grounds for every member of the family. When I talk to readers about their clutter, more often than not their biggest frustration is kitchen counter clutter with messy kitchen tables a very close second. I hear the frustration in their voices when they describe all the random items that end up in their kitchens. They know it should not go there and they desperately want it gone. The problem is they have no idea how to remove it or worse, where to put it. To make things easier, let’s tackle these issues one at a time. What to keep on kitchen counters? When you think about it, the number one tool that is used in a kitchen is actually the kitchen counter itself. So in order to create an efficient workspace we need to clean off those counters so they are ready to use at all times. I find that if you want to know what to get rid of, you first need to know what to keep. And the easiest way to do that is to come up with a specific purpose for your room. Once you know just exactly what happens in your kitchen, you simply need to remove any items that no longer belong. To declutter your countertops I have a few simple tools that will help. These baskets are perfect for gathering up all papers from around your kitchen. Grab a basket and just start filling it up grabbing piles and stacks from your counters and table. If you need more than one basket that’s fine. Just keep going until all the papers are in one spot. If you find any pens, pencils, scissors or other office items grab them as well. Once you have it all, set this basket aside to go through while watching a movie on a lazy Sunday afternoon. Here are a few of my favorite baskets to use specifically for decluttering!! As you are examining the clutter you have left, get yourself a few boxes and label them by room. These will help you to sort through the remaining clutter quickly. Once you have your boxes just start filling them up until your counters are cleared off. Tools go into the garage, toys into the playroom, toiletries into the bathroom. Just keep moving along until your counters and kitchen table are completely cleaned off. Once finished, take each box to it’s designated room to put away next time you are in it. Grab yourself one more laundry basket and use this to hold any items that need to be dealt with in the next few days. School papers, returns to the store, overdue bills, library books, whatever you find that needs attention now. Put this basket front and center so you go through it in the next day or two. This will help relieve any worry that you may lose or overlook something important. Ninja tip: Set a reminder on your phone so you do not forget to tackle this basket. A phone can be an amazing tool and so helpful to keep us from forgetting clutter projects and putting us right back where we started! 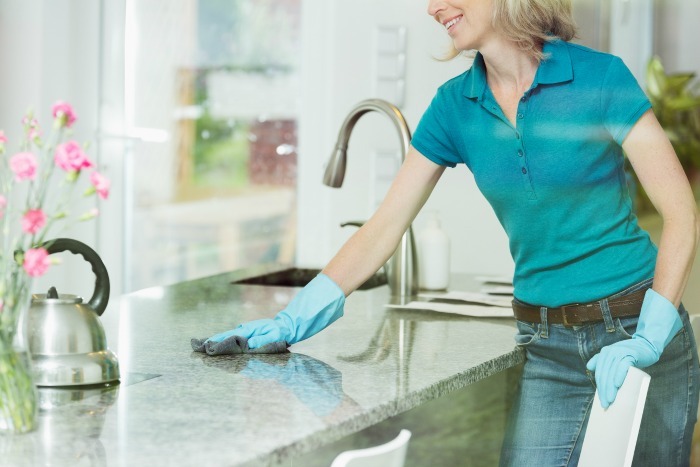 Once everything is gone, give your counters a quick wipe down. Now, take a step back and look over what you have. When you look around your kitchen take note of where you tend to perform certain tasks. Your goal is to only have items on the counter in each area that you use frequently such as every few days. If you use your food processor 3 times a month for example, it will be best to keep it in a pantry rather than out on your counter. Notice this list is pretty small. There are actually only a few items most of us use often and therefore our counters should be open and free of clutter. Remember, the number one tool that is used in a kitchen is the counter so our goal is to keep it cleaned off and ready to use at all times. Ninja tip: Place post-it notes labeling different areas until this becomes second nature. These notes will remind you what happens where and encourage you and your family to only allow items in those areas that truly do belong. Now that you have each area of your kitchen counters setup, there are still a few more things we need to tackle. Take a minute and look around your kitchen once more. Notice any areas that seem to attract clutter. Spots where the kids toss their papers, where the mail ends up, where store purchases tend to gather, or even where dirty dishes pile up. Those areas are your “hot spots” and we will need solutions to keep the clutter contained and keep it from forming again. Daily paper clutter is one of the biggest issues we all deal with. No matter who you are or where you live, you have papers coming into your home every single day. Having a specific system set into place will keep those towering paper piles from appearing again. Have a basket specifically set aside for school papers and daily mail. This is a great way to keep daily papers front and center. I love these baskets and have several in my home. They hold all our papers that tend to gather up each day. If you have the room, just keep a basket on the counter and have everyone toss all papers inside whenever they have them. After dinner simply create a routine where you take this basket with you to deal with. Have a pen and post-it notes inside the basket as well to make any notes on papers that need attention. For example, if you find a bill that needs paid will write the due date on a post-it note, attach it to the bill and put the bill where your designated office area. This will save you time from having to repeat the step of reading the due date. 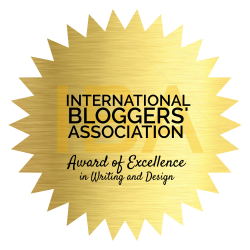 If you come across any papers that need to be dealt with immediately, do so immediately. 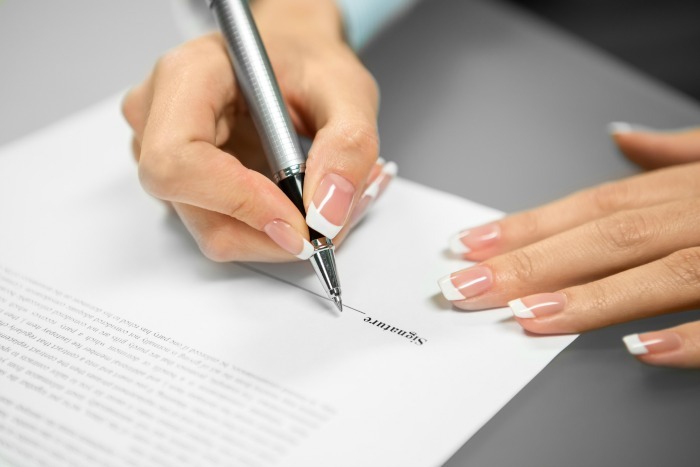 A permission slip can easily be filled out and given to the child in just a few seconds. Take care of it right away so you do not forget. For some reason every time we come home from the store, purchases always seem to end up on our kitchen counters. Sure, it makes sense. After all, most of the items we buy will be kept in the kitchen, so why no put them all there? It’s not the purchases that cause the clutter, it’s all those store bags and receipts that come along with them. Having a specific spot for each will keep those bags from floating around the house and keep receipts from forever getting lost. I find a simple bag holder is all I need to house all those plastic bags and one that fits under the sink like this one is perfect because it is out of the way but is still easy to get to. Ninja tip: Do you have more plastic bags than you have room to store them? Why not tuck a few into donation boxes before you take them to the church or another donation center? Most places are always looking for bags to put items in for folks and your supply will help them out. Just remember to ask first to make sure they accept them. If not, most stores take in used shopping bags as well and you can usually find a box next to the service desk. I like to keep most organizers out of site so the kitchen looks neat and tidy. Keep your bag basket under a seldom used kitchen sink or inside of a pantry. Well, I am so happy you asked! Remember the paper clutter basket from tip #1? That is the same basket where you will toss any receipts that you bring home. That basket gets dealt with every day so you will know that the receipt will get put just where it needs to be so you can easily find it if you need to. The dreaded dirty dishes. It just amazes me how many dishes a family can go through in a day and if you do not have a system in place they can quickly get out of control fast. Take a cue from the restaurants and get yourself a dish tub like these. They are really sturdy, hold quite a few dishes and keep your counters cleared off and tidy. Teach your family to rinse off their dishes before they put them into the tub. Trust me, fruit flies will gather fast and just a quick rinse will keep them away. Whether you have a dishwasher or not, these tubs are so handy. You can load up your dishwasher right from the tub or fill with hot soapy water and wash in the tub itself. Ninja tip: If you have younger children, these tubs are a great way to teach them to set and clear a table. Fill with clean dishes and have your children carry it over to set the table more easily and then use the same tub to gather up the dirty and carry to the sink. Our family used these for years and they were a favorite kitchen tool of mine. Even if you have an office, a few office supplies can still come in handy in the kitchen. The trick is having a way to hold what you need in one spot so it does not migrate all over the place. A desk organizer is perfect for this and you can really find some nice ones that will fit in with your decor. 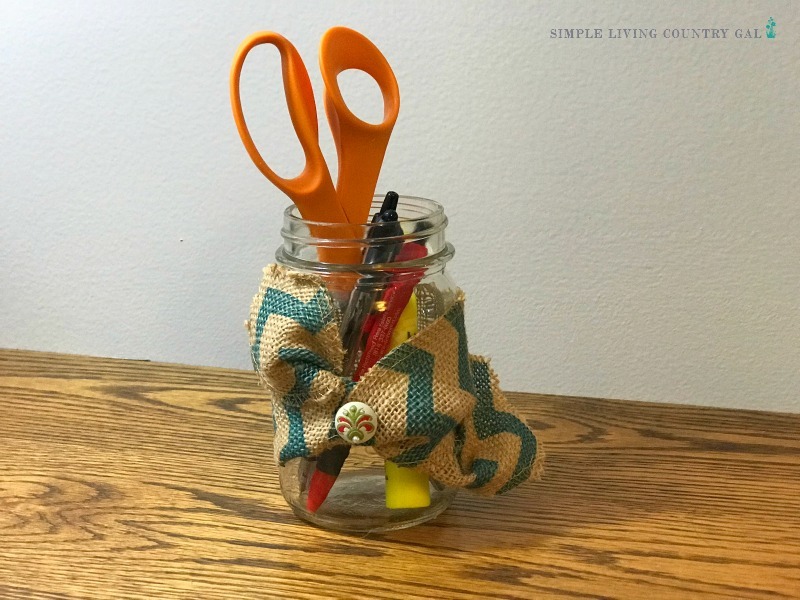 If you don’t want to spend money you can gather up a few mason jars, add a little flair with some ribbon tada….a great way to hold pens, pencils, and scissors. Make sure to keep your organizer in an area where it will be easy to access. If you tuck your organizer way off in a corner making it inconvenient to use, before long you will have office clutter on your counters. Choose the spot that makes the most sense and place your organizer there. You may not consider outgoing items as clutter, but if stop and take a look at what you have that is current and outgoing you might just be surprised. As you can see more than just mail is involved here and because of that, we will need to set up a system to keep things from getting cluttered up. A desktop organizer like one listed below will all work amazingly well here. When selecting an organizer be sure to take into consideration all the items you hope to house. Make sure it is simple, the correct size, and something you will love having out on your counters every day. Another option is a wall mounted organizer. I just love these organizers and find they can really go a long way to keep kitchen counters clutter free. Again, you will want to make sure you choose something that fits your kitchen, has all the features you are looking for and fits in the space that you have available. When it comes to your mail organizer you want this to basically act as command central of sorts. Get into the habit of checking things before leaving the house. If you keep your keys in your mail organizer this will encourage you to stop there before heading out and keep errands from piling up strictly because you forget to take items out with you. Random clutter drives me nuts! I am not sure how it even starts but as the day go on, items that have no rhyme or reason whatsoever end up all over my kitchen. To handle this problem and to keep it from getting out of control, I place baskets, buckets, and bins in each of my rooms to toss items in. This is a clutter busting game changer you really must try. Really, just about anything will work here. It’s all just a matter of taste. Just find something that will hold more than a few items and will fit in with the decor of your room. I have seen buckets, baskets, bins, and even boxes work perfectly well. The key is to select the best size that will hold enough items to keep the random clutter off the counters, yet not so large that it takes up too much space. Whenever you find anything that does not belong in the kitchen and is not an item listen in the previous tips, rather than waste time putting it away, simply toss it into your basket or bin. I cannot even tell you what a time-saving game changer this is. Remember to make sure you empty things out weekly to ensure nothing important gets forgotten or lost. I just carry my container of random clutter and stroll from room to room putting things away. Even with a large container, you are still talking minutes. Compare that to a full on declutter of an entire kitchen that can day hours or even days. With these tips, you should eliminate piles, stacks, and the chaos that counter clutter can bring to a room. But just because I gave you the tips doesn’t mean you are done and good. If you want these kitchen clutter solutions to work, really work, we need to take things one step further. Your job now is to set up systems and routines that will keep the clutter from showing up again. 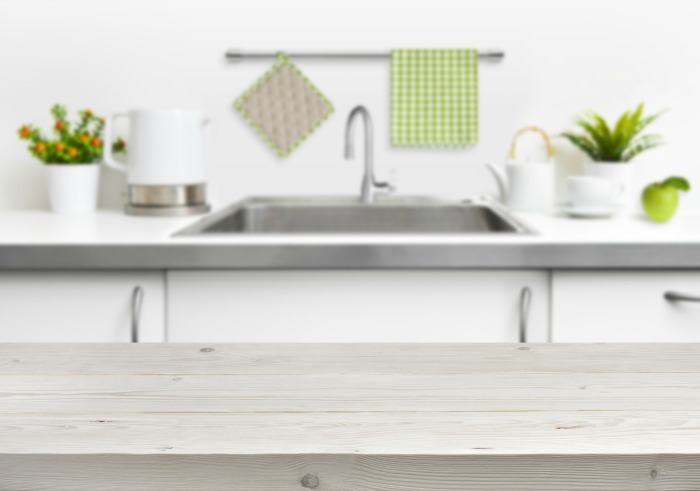 Instill new habits that may seem awkward and time-consuming at first, but after a bit, you will have routines not only for your kitchen but for your entire home. Removing clutter is so much more than following a few steps and you are done. It is developing a new way of thinking. Of seeing your things as tools that require permanent homes in order to use them efficiently. Things that have homes (places where they are kept) are no longer clutter but tools that help us to live our lives. Develop a habit of putting things away, or at the very least dropping them into a catch-all basket to put away later. 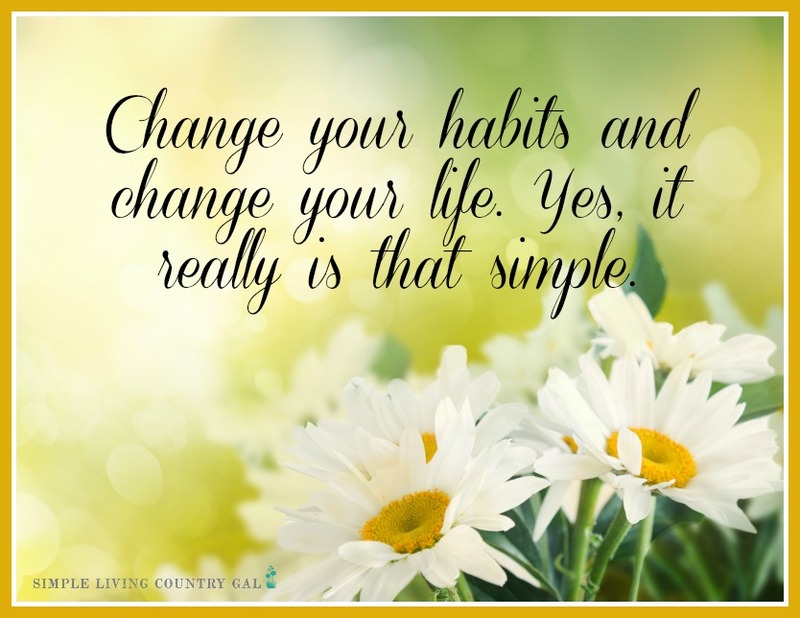 This habit alone will help you remove the clutter. Slowly yes, but remove it none the less. A clutter-free home that we can have without killing ourselves to get there. This article was fantastic! A cluttered kitchen drives me absolutely crazy. I’ve found that it just makes it so much harder to cook in when it’s all cluttered up. The only things I keep on my kitchen counter now are my stand mixer which is used near daily and a pretty candle I like to burn when I’m cleaning up at the end of the day. My MIL has commented that it’s a little too empty for her tastes but I absolutely love it. To each their own right? All of my other appliances get stored in cabinets even if I use them every day because I feel like it’s worth the extra minute it takes to get it out/put it away after to have the clean and clear cabinet tops. Thanks for the article and all the tips! I have to tell you that once I began keeping only my frequently used items on my counter I literally felt free. It was so amazing to see those cleaned off counters that it sparked a love of clutter-free living in a way that has changed my life! I agree with you, sometimes clutter-free is better than convenience.